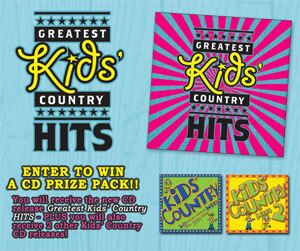 Enter to win the Greatest Kids' Country CD Pacakage -- Top country hits from all of today's top artists recorded for kids by kids! There’s nothing more natural than kids and country music, so it’s ONLY natural that Capitol Records Nashville pairs the next generation of country music tastemakers with the current hits of the format! A collection of country hits performed BY kids, FOR kids (...and for Mom and Dad too!) GREATEST KIDS’ COUNTRY HITS includes some of country music's biggest hits including the 6 week #1 smash “Better Life” by Keith Urban as well as past classic #1 hit like “Write This Down” by George Strait and turns them into sing-along SMASHES for kids. Infectious melodies and fun lyrics make for an engaging combination of tracks suitable for road trips, car pools or any time the family wants some blue jean jams!